After finishing my DDS Module with the Analog Devices AD9835 I want to test it. Because I am very interested in electronic imaging I decided to try it with SSTV. 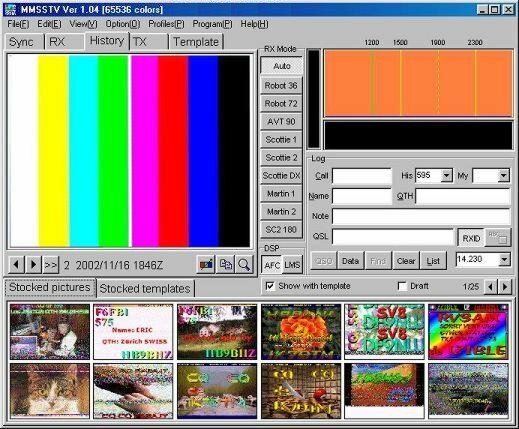 The folowing SSTV testgenerator creates a color bar picture using the Martin-1 SSTV mode. It also sends the correct VIS code before sending the test pattern. DIFFERENT  CONDITIONS   AND  UNTIL  NOW  IT  WORKS   WITHOUT  PROBLEMS. This is the schematic of the testgenerator. 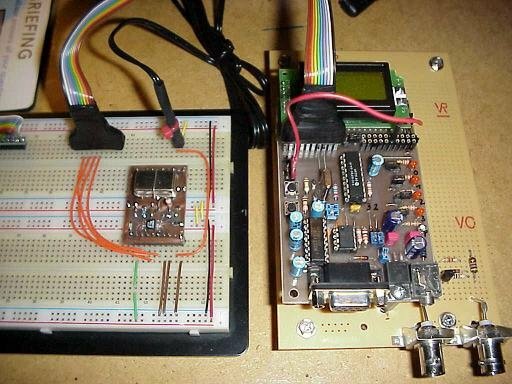 It is based on a PIC 16F84 from Microchip running at only 4 MHz. 20 MHz would give much better control over timing critical functions but even with 4 MHz the timing of the testgenerator is accurate enough to produce a good quality testing picture. When you press the switch S1 the testpattern is sent. After sending the generator waits for the next key press. There is no PCB available for this project. As you can see on the pictures below the whole testgenerator was prototyped using my AD9835 DDS Module and my PIC Prototyping Board on a Breadboard. These are the PIC 16F84 assembler listings for the testgenerator. They are in Microchip MPASM (MPLAB) format. Just copy them into a directory, compile sstv.asm and program the resulting sstv.hex file into the PIC. Or download all of these in this zip file. Here you can see how the module looks during different stages of the building process and how it looks when it's finished. A picture says more than thousand words. There is lot of room for improvements in this project. You can for example add the display of your callsign in the testpattern etc. Feel free to experiment with the soft- and hardware of the testgenerator. If you add some new things to it it would be nice if you drop me a line so that I can add a note about you here.